The black birds hop from log to log. All the while, tilting their heads to and fro. Then after a brief pause they reach into the bark, and with surgical precision, pluck out a squirming grub. Then with heads thrown back they swallow the grub with the ease of an Olympic gymnast dismounting from a balance beam. Hunting grubs on the burned logs. 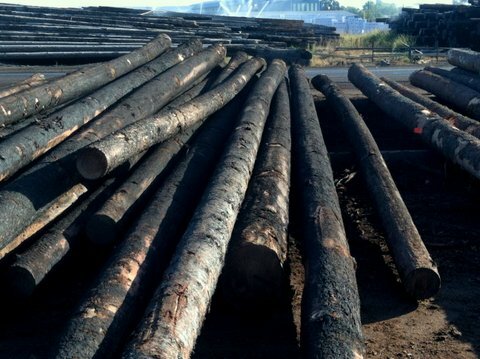 This goes on all day in our log yard. 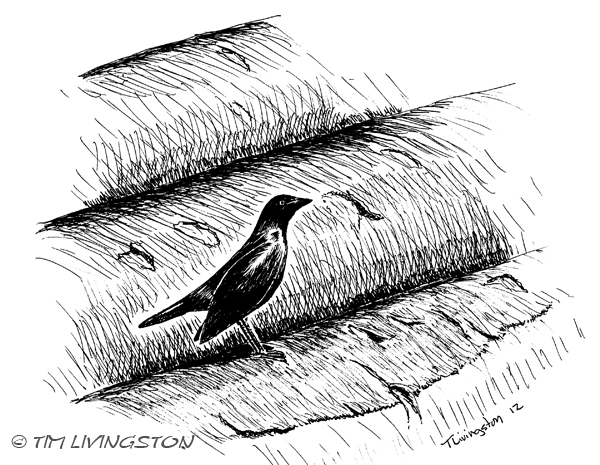 As the logs from the fire salvage operations pour into the yard, so do the black birds. The swarm the logs for this feast of opportunity. 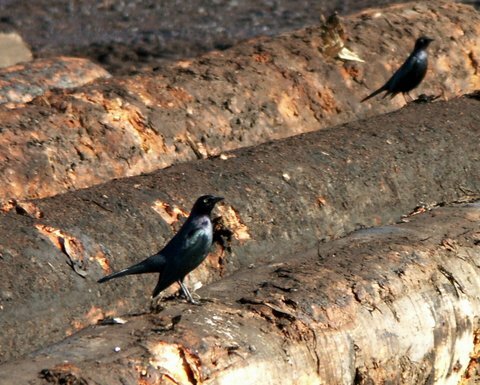 Sometimes they engage in black bird battles for dominion over some particularly grub infested log. I think these birds get fatter every day. Soon they may not be able to fly. Burned logs delivered to the log yard. Salvage logging continues at break neck speed. The beetles invading the logs are an indicator of the oncoming decay. Next will be stain, splitting and then rot. Time and decay are our enemies. The black birds are a constant reminder of the ticking clock. Ponderosa burn fire salvage. Where have all the squirrels gone? 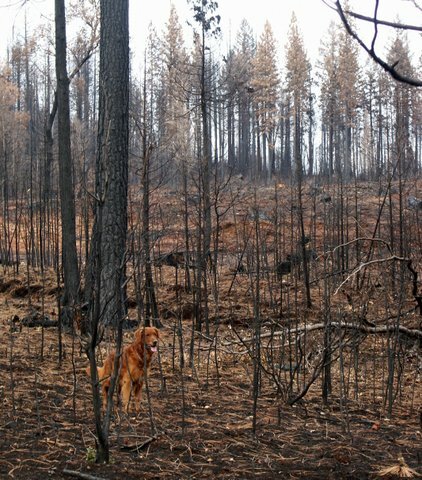 This entry was posted in Drawing, Forestry, Pen and Ink, Wildfire and tagged art, fire salvage, forest, golden retriever, logs, pen and ink, photo, photography, wildfire by foresterartist. Bookmark the permalink. I had warring throughts on your reply.. one is ‘poor squirrels,’ but the other focuses on the dark humor. Hi Divya, it is good to hear from you. You have our permission. I know Mary is replying with some detail. I look forward to seeing your art work of Blaze. I think this will be fun, can’t wait to see it! lovely sketch. and very informative too. What interesting information. I am thrilled to know burns involve salvaging. That shot of your golden amongst the trees is very cool. Thanks Leslie. That golden’s name is Santee and he actually belongs to a visiting friend. Our girls were in heat so I took poor Santee with me to work so he could have a break. Are you talking about Mountain Pine Beetles? We’ve had such a miserable time with them here in central BC. But there are scenes of beauty in the devastation, as you show. I’ve have heard a lot about the Mountain Pine Beetle devastation in BC. After the wildfires here, the burned trees are invaded by a plethera of bark beetles and borers, including the MPB. Next Spring the beetles will spread from the burn into the unburned areas and begin killing more trees. It always take a couple years before things settle down. Problems here with the beetles are nothing like what is going on in BC. However, it will pass over time. Yep, it’s just part of the cycle of nature. It’s also been a great source of inspiration for my art!